Keeping Kids Happy, Healthy, and Hydrated! It’s summer time! Which means that your kids are mostly going to be outside and always on the go. It can be difficult to get them to stop what they are doing and get some fluids in them. Of course, the most important drink to offer them is cold water. However, there are also some great snacks that can keep the kids hydrated, especially when kids can get tired of just drinking water all the time. Watermelon, cucumbers, citrus fruits, grape tomatoes, and bell peppers are a wonderful way to give your kids snacks that will not only fill them up, but also hydrate them. Watermelon, for instance, is majority made up of water, which makes it a great refreshing snack in this hot weather. Applesauce is also a great snack, especially when you freeze it. Yogurt, whether it is plain or has fruits, also contains a lot of water. If you blend some frozen berries into plain yogurt, you will end up with a delicious sorbet like taste. Pasta is another great food. When it cooks, it absorbs water. Try cooking fun shaped pasta; your kids will enjoy eating them. 100% juice is a good alternative to water at times, when kids are getting tired of just drinking water (limit 6-12 oz of juice per day). However, stay clear of sodas and drinks with added sugar and/or artificial sweeteners because instead of hydrating your body, it slows down fluid absorption in the body. Pouring sparkling water to fresh fruit juice to get that soda feel can be a good alternative to regular soda. These tips can help your kids keep hydrated during this heat and have a healthy summer as well! 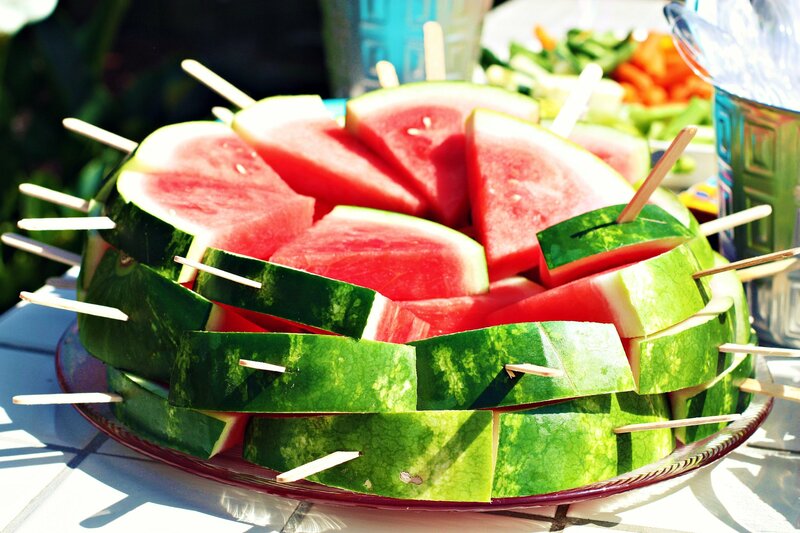 What are some of your favorite hydrating summer snacks? Great tips! I have 6 boys here this week, all 10 and under, and it’s 104 outside and I NEEDED these ideas! Thanks so much!